Jason Cantor could describe himself as an engineer, biologist and biochemist, but don’t try to put his expertise into one box. Cantor, a scientist exploring the environmental influences on cancer cell metabolism, is launching a new lab in the Metabolism Theme at the Morgridge Institute for Research and joining the University of Wisconsin-Madison departments of biochemistry and biomedical engineering this August 2018. Cantor earned his bachelor’s degree in chemical engineering at Cornell University, and it was about halfway through his undergraduate career that he realized the engineering mindset could also be applied to biological questions. He went on to do doctoral work at the University of Texas at Austin where he came up with new strategies to engineer enzymes for cancer treatment. 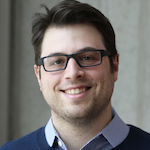 At the time, there was a resurgence in the field of cancer metabolism, and, for his postdoctoral work, Cantor decided to venture outside the scope of traditional engineering and instead join a fundamental biology group interested in cancer metabolism. This led him to the lab of cancer biologist David Sabatini, part of the Whitehead Institute at MIT, where Cantor helped develop a new method to study how environmental factors impact cancer metabolism. Much of science relies on models—whether it’s animal or insect systems like mice and fruit flies or a colony of cells in a petri dish—to conduct and test experiments. These models are a simplification of reality that can be useful in explaining and exploring our world. Sometimes models are too far removed from reality to be useful, and it’s always a challenge in science to continually improve the models to close those gaps. During his time at Whitehead, Cantor helped develop a new synthetic medium—a liquid that allows for the growth, storage or transport of cells in lab settings—that better reflected the composition of human blood. The synthetic medium, referred to as human plasma-like medium (HPLM), basically rewired the metabolism of the cultured cells. Not only did the medium have dramatic effects on the metabolic landscape of these cells, the scientists were able to discover an unexpected method of metabolic regulation. His findings beg the question, how are environmental factors affecting cell biology and the way in which we currently evaluate and discover new therapies? Building off this foundation, the Cantor Lab will explore how environmental factors influence both cell biology from a fundamental aspect and from a translational aspect. “In creating a better model system, we can take these biological insights and potentially exploit them for therapeutic purposes, whether engineering targets within the cell or actually manipulating the environment for a therapeutic benefit,” Cantor says. Dave Pagliarini, director of the Morgridge Metabolism Theme and associate professor of biochemistry at UW-Madison, says Cantor’s talents and expertise will be a great addition to the Madison research community. Cantor says he was drawn to Morgridge and UW-Madison because of the strong foundation of metabolism research and the opportunity to contribute to and collaborate with a thriving community. Story by Courtni Kopietz for the Morgridge Institute for Research. See the original here.